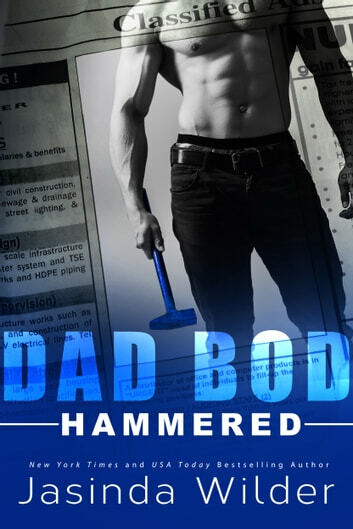 Dad Bod Contracting—for ALL your domestic contracting needs. Have a leaky faucet or clogged disposal? Need a new patio with intricate brickpaving designs? Want your garage transformed into a yoga studio? Dad Bod Contracting has you COVERED. Our clean, well-mannered, and friendly professionals pride themselves on attention to detail. Every job comes with a 100% customer SATISFACTION guarantee. No job is too small. Hand us your “honey-do” list and we’ll get it done, and we’ll look good doing it! A good job well done is one phone call away, so call Dad Bod Contracting today! It started with a window that was jammed shut. Pretty simple, right? All I wanted was to open the windows while I tidied the house. I’d been after my no-good husband to do it for months, but he never did. And then he shacked up with his secretary, leaving me with a pile of bills, husband-free for the first time in ten years, and with a house that was falling apart. The ad popped up on the side of my social media feed—a local contracting agency willing to do pretty much anything. Since I don’t really know a screwdriver from a ratchet, I gave them a call. And let me tell you, the ad was NOT lying. Jesse O’Neill can do it ALL…and looks amazing doing it. He fixed my window, so I called him back to fix the sagging, splintery front steps. Which led to him fixing my kitchen sink. And then he recarpeted my stairs. And then fixed the squeak in my bed. He was supposed to fix my house, not my rusty, sputtering libido. And certainly not my broken heart. I always admire how Jasinda can write in so many genres, but you can always hear her voice. According to GoodReads this is my book #48 by Jasinda and I can say it was been as good as always. Dad Bod characters are not your common romance characters. They are in their forties, so it's so much easier to relate to them. Jasse and Imogen chemistry is of the charts and their banter is amazing! I read the whole book with a smile on my face. Hammered is a great introduction to the series and I can't wait to read more. What a ride !! OMG let me tell you, you need this book !! Hammered by the outstanding author Jasinda Wilder is the first book in her brand new series Dad Bod Contracting. Inmogen Irving is a newly divorced woman. She´s disillusioned, betrayed in the worst way, lonely and a bit bitter. And then there´s Jesse O´Neill. He´s the construction guy / handy man. He´s a hot guy and he´s really good with his hands. Theses two hit it right off, but both have issues and baggage. Jesse doesn´t do heartbreak. He´s not a relationship guy and Imogen is a strong heroine, yes she´s a bit battered but she knows what she wants. Both ahve this crazy insta connection and their chemistry is through the roof high. I started reading and was hooked from page one. The writing is excellent and the story is more than captivating. I read the book in one sitting, I had to know what happened to the characters, asap. Hammered is ascorching, just wow wow wow- fans herself read. This story put a smile on my face and I can´t wait to read the next book, Drilled - Audra and Franco´s story. Loved it! Funny and relatable. Nice change to read this sort story with characters that are in a different age bracket. Really enjoyed!